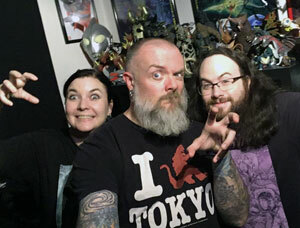 Rachel, Kyle and Bryan check under the numerous Portland bridges for the Trollhunter in this discussion episode! We’re trolling Norway in this episode because our daikaiju discussion series takes a look at Troll Hunter (2010). We really enjoyed this found footage film and we apparently weren’t alone since the listeners seemed to favor this film as well. Strap yourselves in, Kaiju Corps… next month, we are watching the Korean “remake” of Yonggary from 19999, Reptilian. This is another one that isn’t part of the Kaijucast collection as of this writing, but I am hoping to pick up a DVD of the movie and do some research on the film itself before the discussion. If you’d like to submit your thoughts questions and reviews for the episode, please make sure you turn in your homework by August 26th. 8/18 Rifftrax Mothra — and if you’re in Portland, Oregon come see the movie with us!